← Merry Christmas From The SoSF Gang! Well, it may be the 26th and all but yuletide festivities are still in full swing over at Winkerbean Manor aka The House That Tony Built. Apparently Holly’s mother has been staying there this whole time, as that whole “band reunion” thing appears to have been nothing more than an excuse for Holly’s mom (does she even have a name?) to make Funky’s depressing life even more of a living hell. Despite it being a pretty tired old trope (mother-in-law gags are as trope-y as it gets) I was not altogether un-amused by Funky’s reaction there in panel two, nor by his sidewards comma eyes in panel one for that matter. Maybe it’s my misguided Christmas cheer, but IMO this is at least a baby step up from seven week PTSD arc or watching a befuddled amputee bumble around haplessly for a week, so there is that. I mean sure, it isn’t “good” by any measure but given how abysmal 2018 was overall, I’ll temporarily take it. And what are they doing, like in general? Do they have a wedding date? Are they still in the service? Are they working at Montoni’s? Does Cory have a new job as Private Snafu? Do they live together? Where? It’s so bizarre. Cory came home YEARS ago, way back when Starbuck Jones was still a comic book, yet he’s still stuck in the same rut he was when he first proposed to whatshername. And as far as I can tell Rocky hasn’t spoken in years as well. Remember her harried poor white trash mom? Boy, the years just fly right by in the Funkyverse. I think I posted something about this before, but Batiuk doesn’t seem to let his characters “live” when they’re not featured in the strip. So if Cory’s plots don’t get any play, he essentially is doing nothing while waiting for the next time he shows up in the strip. So three years go by and Cory shows up again and he’s exactly the same guy he was three years previous. He hasn’t done anything. The only exception to this is something like Rana, when Batiuk realizes that he can use one of his shelved characters to flog some prestige arc. But of course he screws that up because, in this example, Rana’s entire development comes as a surprise to everyone. She went from being a shallow irreligious vain cheerleader to a hijab-wearing devout Muslim who wants to move to Afghanistan and we never saw any moment of this transition nor did any of the characters talk about it. She just showed up one day fully transformed, and it came as a complete surprise to her adopted father. Because like us, it’s the first time he’d ever heard of it. Thanks a lot – if Batiuk wasn’t already thinking “double wedding,” he is now. The only way out of this may be, Funky **thinks** the “elders wedding” is happening, but it turns out to be a giant misunderstanding concerning plans for Cory’s wedding. What a gallery of mugs, each poorly drawn visage more hideous than the last. 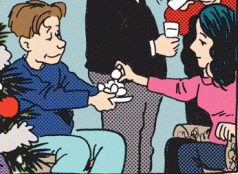 In the second panel, I like the way the Christmas tree branch protrudes in front of Holly’s face. I agree! This is AWFUL draughtmanship. “So, when are you getting out of here?” is a good question to ask a family member when you’re literally still sitting around the Christmas tree. True. Can’t say I blame Holly though.